As you are probably more than aware July 29th is the date Windows 10 is released to the world and with that release Microsoft is changing the way it brings Windows to your PC now and in the future. So with that in mind we at Endeavour Information Solutions have prepared a short Q&A guide for the forthcoming release. We have been receiving increased reports of people calling individuals and businesses across NI claiming to be from Microsoft who want to fix a common problem or virus on your computer. They then talk you through setting up remote access in order to allow them access to your PC to resolve the problem. You can imagine that once these people get access to your computer the kinds or risks you'll then be exposed to in terms of fraud or even ransom as they encrypt your data and refuse to give it back unless you pay them a sum of money. Microsoft technical support will never call you directly unless you have initiated a support request with them beforehand. Microsoft don't email or call you to let you know your PC is infected, then offer to come round and fix it. Never let any company who you do not know or work with have access to your computer remotely. Never open email attachments or click on email links from companies or people you do not work with or are expecting information from. A common threat is one from a courier service with a file attached that has information regarding your delivery. Ask yourself first, why would this be sent to me, did I order something and why are they not telling me in the email message itself? A good rule of thumb with handling email is if you don't know the sender and are not expecting it, delete it...! Don't worry about taking that approach, if it was legitimate someone will make contact again. Unfortunately, computer security elements alone such as antivirus and firewalls are vital but equally can only do so much to protect you. The other factor to consider when securing your IT systems is you and your users. If they are not made aware of the potential threats out there and given guidance on appropriate use of IT then you are putting yourself at more risk than you need to be. As you might have seen in the press already over the last week or so Microsoft has told the world that it plans to release Windows 10 on July 29th 2015. There has been various amounts of positive and negative feedback about this latest version of Windows, some accurate and justified at the time and a lot not so accurate. So, with its release imminent, I wanted to give some of my thoughts about it and try and answer some of the basic questions non-techie people might have about it. The days of the IT upgrade where everyone has to take a day off for the IT people to get new software installed onto their PCs is over for those businesses using Office 365, as it is continuously updating with new features all the time. As this episode of Office Mechanics shows there have been over 450 new features in the last year alone and more to come with Office 365 now extending to different platforms such as iOS and Android and with it offering more than just a place to store your stuff. Check out the short video below to see what has been happening and what is coming our way soon with better integration and new applications joining the Office 365 family such as Office Delve and Sway. For more information on what Office 365 could do for your business or to arrange a free demonstration or trial, you can contact us at solutions@endeavour-is.com or call 028 9031 1010 at any time. This week is Microsoft's annual developer conference and as such Microsoft tends to use this conference as the setting stage to make a lot of announcements about things coming in the near future, and one such announcement has been the name of their new browser called, Microsoft Edge which will be coming as part of forthcoming release of Windows 10. According to Microsoft, this browser platform utilises modern web content and security standards and is built for doing not just looking, with built-in note taking and sharing; a reading pane for no distractions; and integration with Cortana, Microsoft's digital assistant on Windows Phone and Windows 10 devices. Why would my business want Cloud Computing? If we go back in time five years any discussion we would have had about technology for a business would have probably involved topics such as: server hardware, reliable and flexible access to email, having enough storage for growth, assurance of backup and speed of recovery. These topics have not changed today, but where all of these things would have been based on equipment running within the business itself and would come with a lot of flexibility, they also came with a lot of additional costs in terms of service contracts, software upgrades and periods of downtime with productivity loss when things either went wrong or something needed upgraded. So something had to change! So back to today and that same business conversation in terms of the options available have changed quite a bit. For example, email is usually one of the most important applications in a business today, so it needs to be reliable. So moving this out of your building where the internet connection may not be the most reliable into an environment that will always make sure email keeps running and is kept secure for the fraction of the price of running a server in your building can be quite compelling. You also have the added benefit of not worrying if your office internet connection goes down not getting your email, as you'll still get your email on your phone, tablet or anywhere else you are with an internet connection. Now that can be very compelling! Costs are measureable and controllable - just like keeping the lights on in your house effects your electricity bill the same can be said for cloud computing. These services usually work to a per user, per month or number of units consumed over time type of model. So if you increase or decrease usage this is proportionate to the price you pay per billing period. Not everything today is as cloud computing friendly as email or websites. Some of that is down to the variances in the speed of the internet connection depending on where you are or what you are doing. But the majority of the issues are down to how certain applications are designed; if they were designed to run on a server then they are best kept on a server. However, on the plus side the server they now run on now doesn't have to be the top of range specification, because now the server is going to be doing a lot less than it did before and doesn't need to be as powerful or cost as much. Even as I write this, more and more forward thinking software companies already have or are working on moving their applications to this type of environment and the ones that don't will be left behind as this technology is only getting better as each day passes. For more information on how cloud computing could save your business time and money, give Endeavour a call today on 028 9031 1010 or email solutions@endeavour-is.com and arrange to see a first hand demonstration of cloud computing at work and we can show you what it could do for your business. So you are about to upgrade your ICT systems and a number of the potential suppliers you've been talking to are recommending a cloud based solution - but how can you be sure your information will be safe? It's one of the first and most common questions I get asked every time we meet with a customer and demonstrate one of the Microsoft Cloud Services, such as Office 365, Dynamics CRM Online or Microsoft Azure. It's a really important question and is a completely understandable concern for any organisation considering a cloud based solution. However, when we start to look at what most of these customers currently have in place we normally discover that a move to a service such as Office 365 is actually more secure than what they have in place at present - let me explain. There is more to IT security than who can see your data. There are a variety of different risks to mitigate on a continuous basis, so it's not just about where the ones and zeros are stored but more about how your information is stored based on your company's need and the layers of protection both physical and logical that are applied to that information on an ongoing basis. So, if you think about an organisation that has a server located within its premises, there are all kinds of risks some of which are addressed continiously such as backup and some that are probably not addressed quite so regularly such as software upgrades, auditing, security patches, information classification and business continuity. Then there are the basic risks such as physical security, power, cooling and connectivity which are all the addressed with strict policies and standards along with failover systems in a Microsoft cloud environment but would be very expensive for your typical small/medium sized business to implement in-house. Therefore, your typical small/medium organisation will usually accept some of these risks but the argument would be if they did move to something such as Office 365 they would actually increase their information security and business continuity capability compared to running their information systems on servers within their offices. This is just one of many layers of security that is implemented within the Microsoft Cloud Services stack and there is far more than we could cover in one news item. However, its safe to say that Microsoft as a cloud services provider does take information security serious and as a provider as Software as a Service (SaaS) in the case of Office 365 has a wide range of internal access controls, multiple security technology layers, redundant/backup systems and compliance monitoring with independent security auditors. So the answer we provider our customers is: "Yes, Office 365 is not just secure but is likely to be more secure and reliable than the server in your back office." Not only that it will continue to be reviewed and upgraded everyday and you as the end customer can be as involved in that as you want or need to be going forward. For more information on just how seriously Microsoft takes the security of its cloud services you can visit the Office 365 Trust Centre where you will see first hand the facilities and measures that are implemented and maintained on an ongoing basis. It's 2007 and one of the most common things any business person has in their jacket pocket or bag is a BlackBerry. It was the de-facto standard of phone and email on one device for that time and anyone who was anyone had one and would tell you, even today, that it was the only device they "ever had" that allowed them to type quickly and accurately. Then in June of that same year and the Apple iPhone is released. Most business people thought it would be a flash in the pan but as we all know today, it wasn't and the iPhone along with various Android alternatives and the occasional Windows Phone now take their seats at what once was a fairly exclusive table. Sorry Windows Mobile, Nokia Communicator, Palm etc. but you know its true. Well if you are one of those BlackBerry addicts that I meet all the time who still wish they could go back to those good old days, you might be interested in the new BlackBerry Classic as the video below shows. It's a classic Curve/Bold styled BlackBerry, all be it bigger to support a larger battery, screen and with it a more plastic build quality compared to the original, but with all those little shortcuts you know and remember, along with some new tricks that might make it popular with those who wished they had a proper keyboard again. Personally I have no idea how good this device was then or is now. I just remember at the time that I was one of those loyal Windows Mobile users who got email OK, but didn't really have a great phone experience and couldn't no matter how many devices I upgraded to could connect to their car kit, as Bluetooth just seemed to be a hit or miss myth. However, the fact that BlackBerry has released this device just shows there is some life in the old dog yet and that they believe there's a market in nostalgia. Well, we'll just have to see how well it works out as today the variety of apps and services available is as important as how good the hardware is. BlackBerry 10 the operating system on this new device does bring "some" of those apps and modern services together such as Gmail and Office 365 based email as well as an Android style emulation feature. However, I suspect regardless of all that, there will be plenty of people who over the last few years have just learned to accept an iPhone, Samsung or Microsoft Lumia phone who will love to try this out just for the keyboard memories alone. 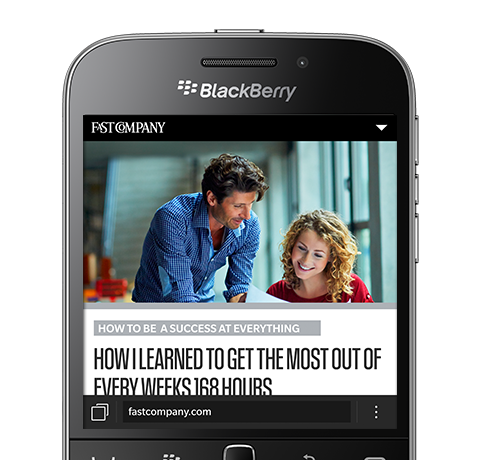 For more information on the new BlackBerry Classic you can go to the BlackBerry website. A desktop computer on a stick! Any of us who have purchased a TV in the last couple of years will have some kind of internet based streaming service either built in to or attached as a device to their TV such as Netflix, Roku or Amazon Fire TV but this is something else... Intel have announced a complete PC running Windows on something the size of a USB stick. The Intel Compute Stick connects to a HDMI port and needs powered by an additional USB port (which most TVs these days have) and from that you get a basic Intel Atom based PC that can be connected with a bluetooth keyboard and mouse to turn your large screen device, projector or TV into a desktop PC for $150 as it was announced at CES this week. So imagine a PC connected to the TV in your house or setup in a company reception area running the latest corporate PowerPoint message or used in an information kiosk or in a workshop area where space and working areas are limited. It really does sound like a good idea but the proof will be how well it operates. The processor is Intel Atom based so there won't be a lot of Adobe Photoshop work going on but it should, based on the specification suggested deliver reasonable performance for web browsing, streaming and general application usage in Microsoft Office which is probably the market it's aimed at. A new year and a new website to celebrate it. Our new website now uses the latest web standards and works on various mobile and tablet formats as well as the traditional desktop. We hope you enjoy our new website and will keep an eye every so often to see what news and events we have running. IT’s all systems go in 2015! Lee Surgeoner, Partner with Endeavour Information Solutions shares some concerns for the local ICT industry going forward along with his thoughts on technology development and what businesses of any kind need to focus on in the next 12 months. We’ll start with a mild tale of caution. The IT sector within Northern Ireland is fairly unique to say the least. On the one hand we have various companies from the US and further afield running their global IT operations from Northern Ireland and bringing with it much needed investment then on the other side there are a considerable number of local long- established IT companies that in my opinion have over the years really innovated and provided some of the best ICT solutions and services anywhere in Europe (although I might be slightly biased in that view) and these are the companies that I am concerned for and how they will be able to contribute to that same level over the next few years. Our local universities produce some of the brightest and best students for this sector but I am concerned that we could start to lose that talent to these global giants who tempt them with offers of generous salaries and benefits and as a direct result our local IT companies just won’t be able to meet the expectations of the future IT professional. I speak with some experience of this over the last year which has meant that we have had to take action. If left unchecked, this situation could get worse over the next few years and impact the ability of local IT companies to deliver such innovation and service in the future. This needs to be considered today; from personal experience this has meant increasing our staff numbers, providing additional training and professional certification opportunities and offering more than just a job but more an opportunity for personal growth and development to ensure that we keep our brightest and best growing within our business. So please bear this in mind, because if proposed changes to our corporation tax system do come into play during 2015, it’s fairly safe to say that additional foreign investment will increase, which although will be great news to our economy as a whole, it might come with a sting in the tail for those in the local IT sector who ignore the best asset they have - their people. On the road to date! In terms of business for 2014 this has been a surprisingly good year for growth across the UK with higher than expected growth in various sectors such as Professional Services, Manufacturing and Retail, all of which feed into the additional development and sale of IT products and services. This is something I can confirm as one of those IT providers which has experienced this growth. However, as recent media coverage has shown it is unclear going forward into the New Year what the position will be in the next 12 months with economic experts saying things will continue as they are now while government is saying we need to be prepared for stormy weather ahead. At the end of the day I am not an expert on the economy; all I can say is that new business has been at a constant level of growth and appears to continue with customers keen to take the complexity out of their IT systems and to take control of their ongoing costs. And so what’s hot in 2015? The hottest ticket in town is cloud computing which vendors of such services continue to push the boundaries of what is possible to be delivered as a service. New functionality comes out nearly on a weekly basis at times and certainly keeps IT companies like ourselves that embrace it, far from being bored. When such solutions were talked about five years ago there was concern from a number of IT companies that it would spell the end of the traditional IT service provider – and in some cases they would be right; the companies that don’t embrace the opportunity and don’t adapt their way of working to meet the new world of cloud-based subscription computing will find themselves losing out to the companies that do. You will be amazed at what can be achieved under a cost-effective subscription that is secure, dependable and expandable to meet very specific business need and that is a business that will continue to grow over the next 12 months. That is what innovative IT companies are focusing on for their customers and those are the IT suppliers that businesses will want to work with in the future. If market analysis is to be believed, 2015 is the year where mobile device sales will out- perform traditional PC sales not only in the consumer market but in the business market as well. So if you are an app developer the opportunities in this market should be considerable. And so what should the new business start-up of 2015 focus on? Northern Ireland has a wealth of great businesses from all sectors that innovate and export their products and services to all corners of the globe. A big part of that is the individuals driving these businesses forward with new ideas and raw determination, usually combined with the advice and support organisations such as Invest NI provide to help ensure their business ideas succeed. So what I would recommend to any start-up is to focus on what you do best; that sounds really obvious, but what I mean is don’t let complexity rule your business. Technology can get complicated so if there is one thing I would advise it would be to get as much of your technology needs from a vendor that provides the service online. That will mean you can control your costs without a high start-up outlay and will be able to work from anywhere, which can be important when you are just starting out trying to grow your business.